This jewelry was made by BiChuang Company, which is specialize in making fashion jewelry. We have our own factory here in China and produce all kinds of bracelets, earrings, necklaces, charms and so on. we use eco-friendly material which is no harm. Adjustable sliding clasp allows for a customized design, Gift-wrap available. The reading glasses chain is made of environmental protection materials, no nickel free lead, low allergic reaction. Chains were well packaged in a branded velvet bag,well for protect in transit and beatiful as a gift. 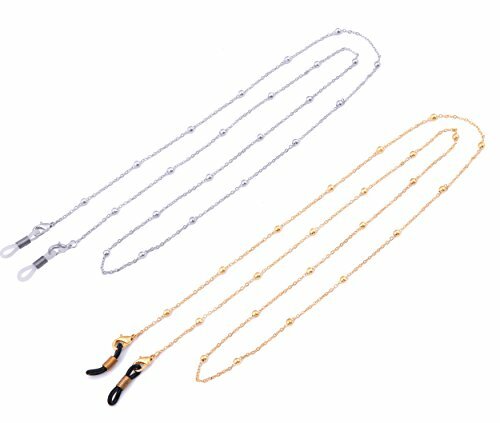 The length of the chain is about 80cm (31.5inches), fit for most people. Purchase Guarantee: Product Replacement or Refund Guarantee; Good Pre-sale Consulting and Great After-sale Customer Service. Maintenance Tips：Pay attention to Water-proof, Moisture-proof, Prevent Corrosion, Protect the Surface Coating from Contamination and Impact. If you have any questions about this product by LIKGREAT, contact us by completing and submitting the form below. If you are looking for a specif part number, please include it with your message.